User interface is the window through which the world now experiences any service/product. A powerful user interface bridges the distance between user thoughts and digital outcomes. Understanding user behaviour and offering solutions to match their requirements is key for unlocking an exceptional user experience. At DigitalAtrium we deliver user-centered design to produce a predictive, cohesive and desirable effect on target audience. Our experienced design solutions are more profound, also we make sure that every design we offer is a part of client’s business and gives a unified entity with required degree of integrity. We build User Interfaces (UI) that let users accomplish what they need from an application and our UX designers focus on making the User Experience (UX) even better. They focus on designing the user experience for applications after doing a user and workflow analysis and conduct usability testing on both prototypes and launched products to assess the quality of user experience. Exclusively our business solution offerings provide UI or User Interface Design that focuses more on how the design of the information is laid out within the application page. UX or User Experience Design focuses more on how the final design output feels from customer perspective. 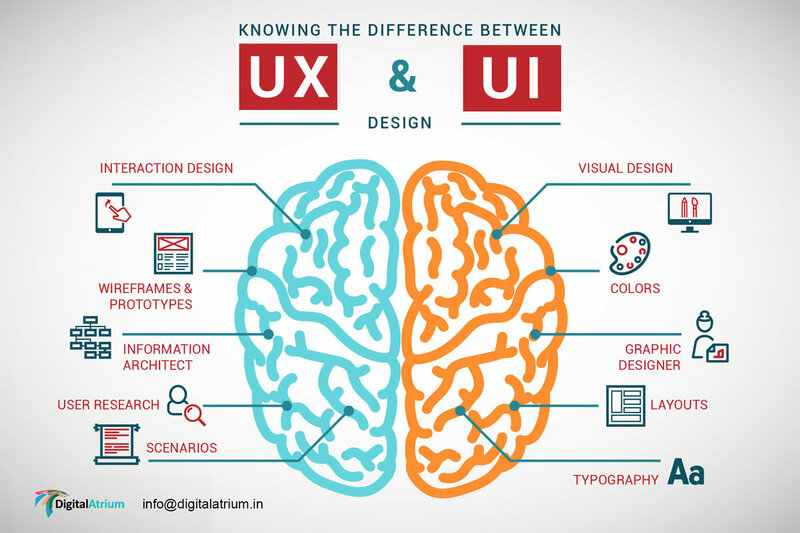 UI (User Interface Development) and UX (User Experience Development) both focus on the customer expectations. Building out new interfaces and organizing the information within the appropriate layout to engage your audience is an art form. Having an intuitive application is the holy grail goal for all products companies, but the process to reach that goal requires a various set of skill sets and out-of-the-box thinking to really become effective. If you are looking to build a better workflow and layout within your application, then a specialized UI/UX Design & Development team is needed to help understand your users and workflow in order to build a better align application. We at Digital Atrium ensure that interaction with your intellectual property delights end users by working with us.